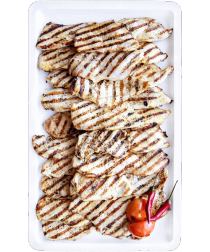 At Dalle Valle we always serve a variety of delicious a la carte dishes in addition to our buffet. 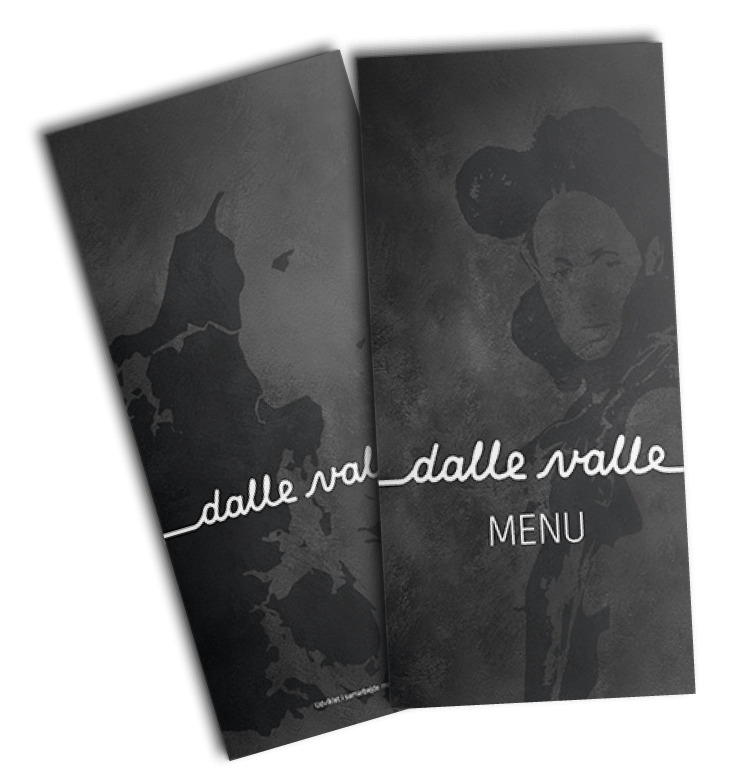 Read more about the dining options at Dalle Valle below. Mixed salad with avocado, pomegranate and salted almonds. Mixed salad with goat cheese, apples, salted almonds and honeyed walnuts with lemon. Salad with grilled chicken breast, croutons, parmesan and caesar salad dressing. Stripped beef fillet in salad with tomato, cucumber, red onions, pine nuts, garlic croutons and pesto dressing. Salad with chicken, avocado, tomato and red onions with caesar salad dressing. Salad with avocado, smoked salmon and cucumber with salted almonds. Served with homemade pesto on the side. Bruschetta with tomato and fresh olive oil. Bruschetta with tomato, garlic and parma ham. Bruschetta with tomato, garlic and mozzarella cheese. Ask the waiter for today’s soup. Served with bread. Our version of the classic dish: Nachos with cheddar, olives, jalapeños, salsa, guacamole and sour cream. Nachos with chicken, cheddar, olives, jalapeños, salsa, guacamole and sour cream. 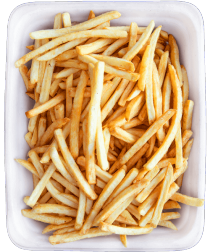 A classic Danish dish served with french fries, greens, lemon and remoulade. Assortment of snacks with onion rings, chili cheese nuggets, chicken tenders and chicken nuggets. Served with guacamole and BBQ-dip. Classic shrimp cocktail with salad, avocado, chopped cucumber, cherry, tomatoes and thousand island dressing. 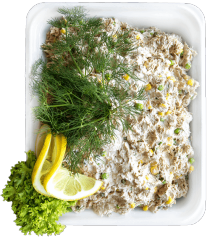 Also available as a main dish for 119 kr. Vegetarian lasagna with bechamel sauce, spinach and cheese. Spaghetti with fresh, homemade bolognese sauce. Penne with vegetables and tomato sauce. Spaghetti with egg, bacon and cream sauce. Penne with chicken, saffron and zucchini in tomato and cream sauce. Penne with beef tenderloin and onions in tomato and cream sauce. The classic lasagna with beef, bechamel sauce and cheese. Fettucine pasta with salmon and shrimps in cream and tomato sauce. Penne with bacon, chili and garlic in tomato sauce. Organic brioche bun with grilled, minced beef, salad, tomato, cucumber, red onions, bacon, cheese and aioli. Served with potatoes of your choice and aioli dip. Organic brioche bun with 2x grilled, minced beef, bacon, onion rings, cheese, aioli and BBQ sauce. Served with potatoes of your choice and aioli dip. Organic brioche bun with crispy chicken tenders, BBQ sauce, mixed salad, tomato, cucumber and red onions. Served with potatoes of your choice and aioli dip. Organic brioche bun with grilled chicken breast, salad, tomato, red onions, bacon and aioli. Served with potatoes of your choice and aioli dip. Organic brioche bun with a vegetarian patty, fresh tomato, cucumber, red onions, mixed salad, aioli and pesto dressing. Served with potatoes of your choice and aioli dip. Organic brioche bun with fillet of beef, aioli and ketchup, jalapeños, salad, tomato, cucumber and red onions. Served with nachos, cheddar, salsa and guacamole. Organic brioche bun with grilled beef, cheddar, red onions, pickled cucumber, aioli and our ‘Spicy Chili Cheese Tops’. Served with potatoes of your choice and aioli dip. American inspired sandwich with chicken, bell pepper, mushrooms, onions, cheese and a twist of BBQ sauce. Served with potatoes of your choice and aioli dip. Crispy bread with curry dressing, grilled chicken, bacon, lettuce, tomato, cucumber and red onions. Served with potatoes of your choice and aioli dip. Smoked salmon served on crispy bread with tzatziki, wakame, lettuce, salted almonds and tomato. Served with potatoes of your choice. Served cold and aioli dip. 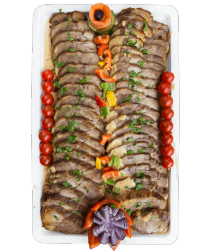 Slices of beef fillet served on crispy bread with aioli and pesto dressing, lettuce, tomato, cucumber, parmesan and red onions. Served with potatoes of your choice and aioli dip. Served cold. Crispy bread with hummus, grilled zucchini, aubergines, bell peppers, artichoke hearts, red onions and sun­dried tomatoes. Served with potatoes of your choice and aioli dip. Served cold. Potato wedges, french fries, crispy chicken stix, chili cheese tops, onion rings or tzatziki. Served with garniture of the day. Free choice of potatoes and sauce. Grilled beef with garniture of the day. Free choice of potatoes and sauce. Served with today’s garniture. Free choice of potatoes and sauce. The chef’s personal version with baked and fried fillet of plaice, prawns, asparagus, aioli, lemon, dill and Thousand Island dressing. Served with garniture of the day. Free choice of potatoes and garlic butter. Italian dessert with chocolate, nuts and ice cream topped with cocoa. Brownie served with vanilla ice cream and chocolate sauce. Banana split served with chocolate sauce, vanilla ice cream, whipped cream and roasted nuts. Cold Italian cake based on coffee with a hint of liqueur. 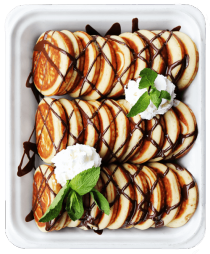 Served with chocolate sauce and whipped cream. 3 types of ice cream served with fruit, roasted nuts, chocolate sauce and whipped cream. Choose between our desserts and combine with your favorite coffee. Half price on a la carte does not apply to this offer. Free bottle of Sourcy mineralwater on the house when purchasing a bottle of wine. Earl Grey, White, Green or Chai tea. With tequila og coffee liqueur. With Baileys amd coffee liqueur. Vanilla, caramel, chocolate, almond, coconut. Served with whipped cream and 4 cl alcohol. With Flor de Caña rum. Raspberry w. mint and lime. Ask the waiter for today’s selection of smoothies. Belgian IPA is a hybrid between a Belgian Blonde Ale, characterized by a distinctive yeast powder and distinct malt, and a classically-hopsed IPA type that, in combination with botanical flavors, results in a complex but extremely interesting beer. Lottrup American Ink is a fruity and boiled beer with notes of chocolate, liquorice and coffee. American Ink has a long, honeycomb aftertaste and a beautiful full-bodied foam crown. American Ink is brewed on the finest American hops: Cascade, Citra and Simcoe. Beautiful copper red beer, featuring a nice, dense foam and a very fruity scent. The taste is fruity and slightly hopsed with a solid malting body characterized by dried fruit and caramel. Balanced but distinctive - such is Lottrup US Dark Ale with its intense, toasted taste characterized by coffee, chocolate and not least liquorice. It is a rich, fat and soft beer with a slightly fruity aftertaste. Sprouted, bumpy, bitter and fruity. Lottrup Stone Street IPA has a more pronounced malt background, a touch of caramel and a long fruity aftertaste from juice and grapefruit. The preview for Schiøtz Dybsort Porter is the English port. Similar to this, Schiøtz Dybsort Porter is characterized by a powerful aroma with fried malt, but also with notes of chocolate, licorice and coffee. Peach, passion fruit or raspberry. Lemonade blended with ice cubes and mint. Ice cold strawberry pleasure with a twist of lime. Exotic frozen drink with mango and a twist of raspberry. Mojito inspired elderflower drink topped with the Danish soft drink Faxe Kondi. Piña Colada inspired exotic and fresh drink with pineapple and coconut. Refreshing elderflower drink made from our own recipe. Refreshing elderflower drink topped with sparkling water. Home made sweetened ice coffee blended with milk and ice. Our milkshakes are made in coop eration with Monin. Choose between Oreo, strawberry and blueberry flavour. Sojuz Vodka, Triple Sec, lime and cranberry. Sojuz Vodka, Molinari Sambuca, raspberry and lemon. Flor de Caña 4 years rum, Monin Coconut, pineapple and whipped cream. Dalle Valles new signature drink inspired by the Asian bars that are in great development around the world. The Yuzu citrus fruit has come to stay – try it at Dalle Valle. Kraken Black Spiced Rum, Gingerbeer, Lime. Dalle Valles unique signature drink which over the years have been enjoyed more than 250,000 times. You have first been at Dalle Valle when you have tasted a Dalle Valle Passion. Gin, mint, lime and elderflower. Sojuz vodka, apple, lemon and sugar. Whiskey, Triple Sec, lime and Faxe Kondi. Flavour: Sour with mild whiskey. 4 years Flor de Caña Rome, mango, lime and pineapple juice. Sojuz vodka, coffee liqueur and milk. Flavour: Cold, sweet cafe latte. Flor de Caña 4 years rum, lime, sugar and strawberries. Sojuz vodka, lime, cane sugar and strawberries. Kraken black spiced cream, orange liqueur, almond syrup, orange juice and lime. Sojuz Vodka, Faxe Kondi Booster and Lime. Gin MG, mint, lime, sugar and Gingerbeer. Taste: A little sour, spicy, ginger with mint. Flavour: Sour, spicy, ginger with mint. Morgan Spice, Safari liqueur, Mirinda lemon, Coke and Lemon Juice. Jose Cuervo Tequila, coconut, chocolate milk and whipped cream. Ask the waiter for today’s selection of ice cream. Pepsi, Pepsi Max, Faxe Kondi, Faxe Kondi Free, Mirinda Orange, Mirinda Lemon. Orange, apple, or pineapple juice. Ask the waiter for today’s smoothies. Choose between light and cocoa milk. 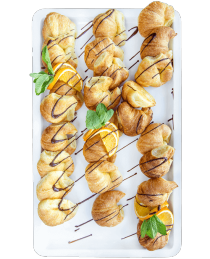 In our brunch and lunch buffet you will find everything that belongs on a Danish brunch/lunch table. And the best part is, that you can fill up your plate as many time as you want. In our evening buffet you can enjoy more than 25 hot dishes along with a various of cold dishes. The buffet varies from day to day, but you’ll never leave hungry from Dalle Valle. 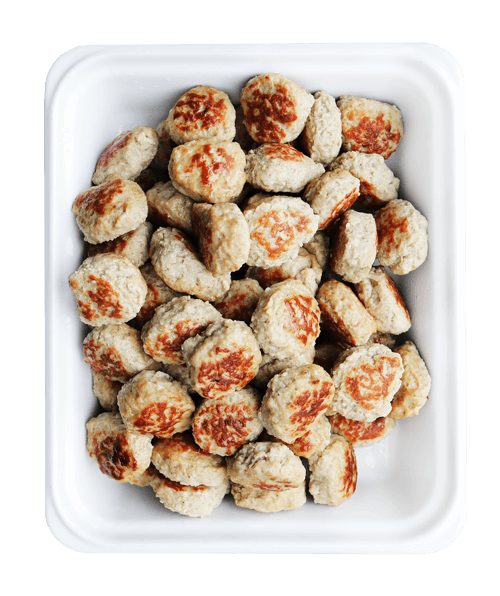 Meat balls after original Danish recipe. 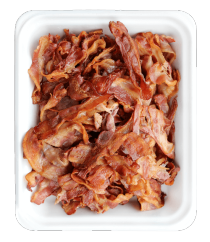 Slices of bacon – perfect for the brunch plate. 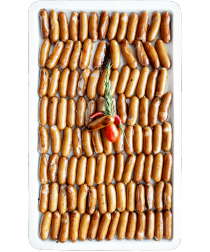 Medium sized sausages perfect for your brunch plate. 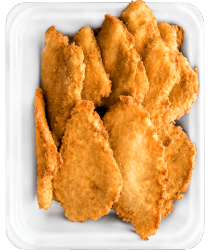 Classic fish fillet – Remember that remoulade is available in the cold buffet. 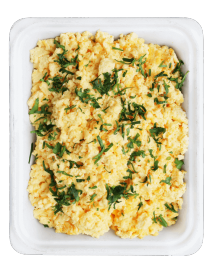 Scrambled eggs after our own recipe. 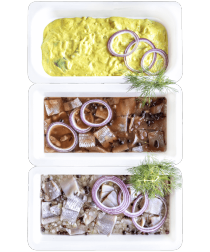 Various herring perfect for the brunch plate. 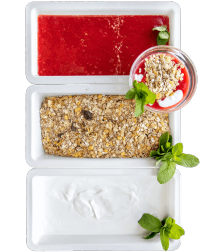 Yoghurt with home-made coulis and müsli. 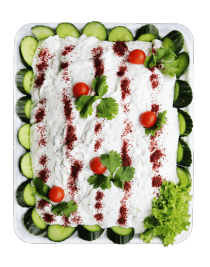 Homemade Greek specialty consisting of yogurt, cucumber and garlic. 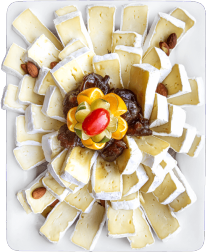 Cheese plate consisting of Brie, Gorgonzola and Gouda cheese. A Mexican classic consisting of minced beef and beans. 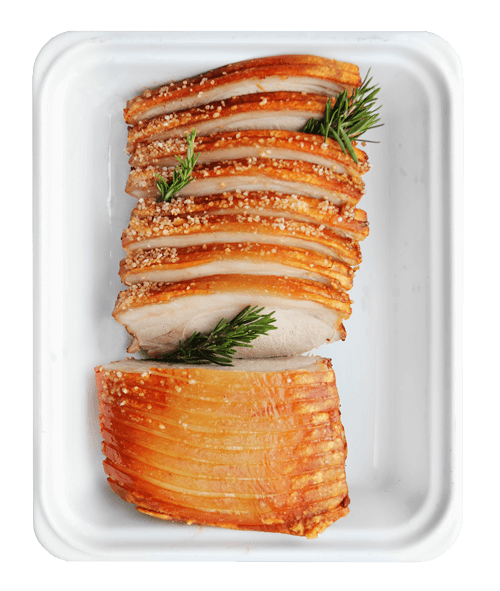 Traditional Danish roast pork – remember, we also have red cabbage at the buffet. Chicken fillet freshly cooked on our own charcoal grill. 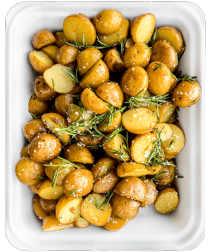 Fried potatoes with rosemary and salt. 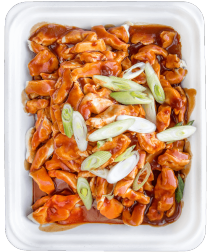 Chicken in spicy homemade BBQ sauce. Oven baked beef cuvette with homemade marinade. 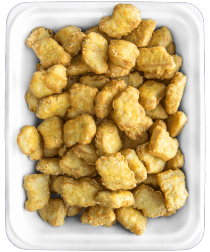 The children’s favorite thats always available at our buffets. 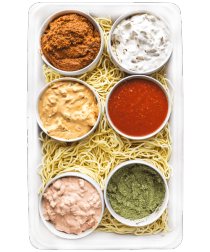 Dish with spaghetti and optional sauces. 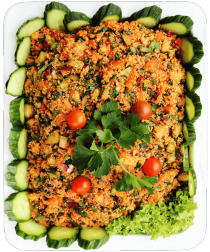 Cold couscous with finely chopped vegetables. Italian classics with mozzarella and tomato topped with pesto. Homemade tuna mousse with mixed green.